natalie's sentiments: I'm an Aunt! I would love to welcome to the world my little niece, Lucca Plum Clifton. Isn't she perfect?! Congrats Sara and Rusty. So much love to you. "It is now the end of a very long day in which Sara gave birth to our baby girl, Lucca Plum Clifton (Lucca as in the Italian city). 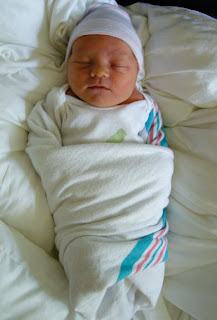 She came to us at 5:30 this evening, weighing in at 7 lbs, 3 oz, and measuring 20 inches. After 15 hours of waiting in the hospital, then 14 hours of hardly-any-rest labor, then 2 hours of pushing, Sara is utterly exhausted but excited about our new little addition. Both mother and daughter are doing well and we appreciate all of your prayers and love." Awwww! 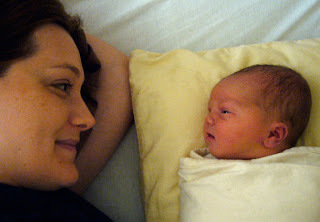 Love that gorgeous pic of Mom and baby! Congrats! I'm sure she'll be swimmin' in lovely baby bracelets with a talented Aunt like you! oooohhh! She is sooo cute. I absolutely love babies, I would kiss her to pieces! I know! I am dieing not being able to snuggle. She's precious...and looks a little bit like Lydia, I think! Woohoo! Congrats! :) What a cutie!